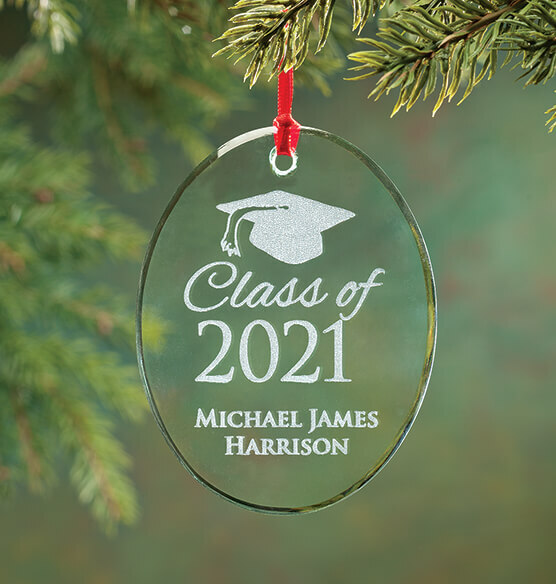 Honoring pomp and circumstance, pride in accomplishment, sweet endings and new beginnings ... this personalized glass graduation ornament celebrates one proud graduate! Our exclusive Christmas ornament is crafted of shiny polished glass with beveled edges, artfully engraved with a tasseled cap and “Class of”. Our skilled artisans will custom engrave this custom Christmas ornament with the graduate’s name and graduation year, creating a one-of-a-kind gift to cherish for a lifetime. Specify name; limit 2 lines, 15 letters/spaces each. Specify year; limit 4 characters. 3 3/4" long x 2 3/4" wide. This ornament was perfect for a graduate. In fact, I purchased 4 different ornaments this Christmas and was satisfied with all my purchases. Will continue to make future purchases. My daughter is graduating in the spring and I get them an ornment every year for Christmas.